Two Box Rolloff trailers for sale at BENLEE, are in Stock for same day shipment. Our two container roll off trailers are built like all our other products, with Safety, uptime, robustness and durability in mind. All our trailers come with 25,000 lb. Axles, Gresen Hydraulic Valves, Parker 1″ lines and more. Ask others. Review their specifications! When it comes to a Two Container Rolloff Trailer there is a reason why BENLEE sales are growing and why we are #1 in Roll off Trailer sales; we make the industry’s leading Roll off Trailers! Two Box roll off trailers are a great productivity tool for hauls over about 100 miles. BENLEE units have high up time so you are always on the road and not in the shop. Roll off trailers are where we began. 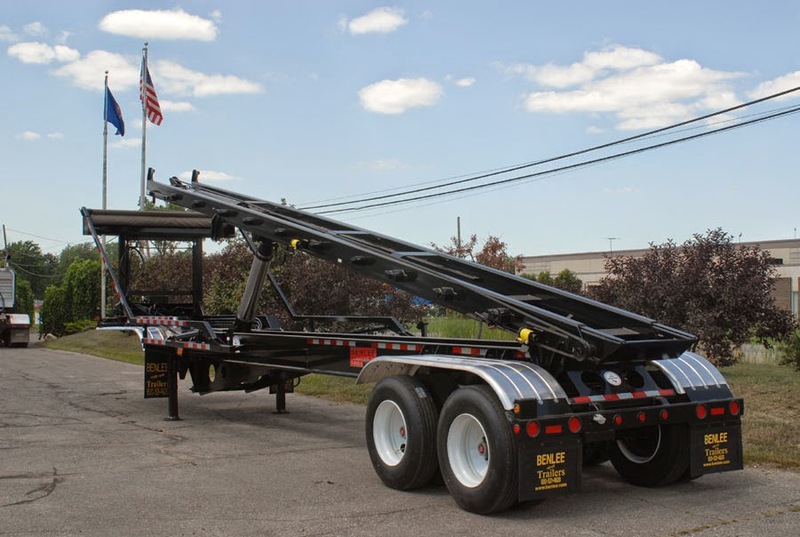 We would like to discuss that there are a number of different types of roll trailers used in North America. 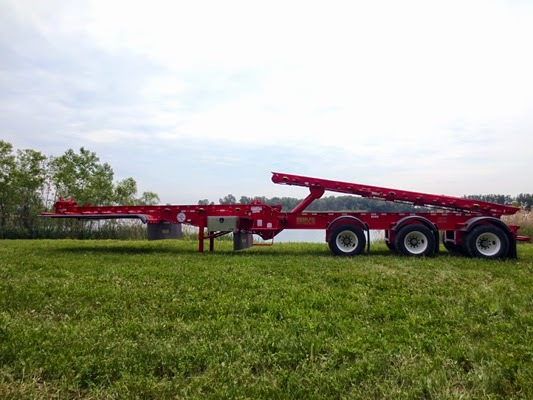 Bridge Master-This trailer is the leader in many markets. It is best known for its 80,000 GVW (Maximum Federal Weight) and can do this with only TWO axles and only 40′, helping it weigh only 17,500 lbs., meaning it can carry up to 20 TONS with ease! The new standard for Scrap Yards, Waste Haulers and more. Conventional-This trailer comes in lengths of 29′ to 44′ and from two to three axles. The most popular version is a 40′ Tri-axle that is 80,000 GVWR and can be over permitted in some states. It is a true heavy haul unit and it can pick up any load you give it. It weighs 22,000 lbs., and it is a unit that can not be beat for picking up those over permitted loads. “Multi-Axle“-For Michigan, Canada and Mexico-Up to 8 Axles. For very heavy loads. Super Mini-A Roll off Truck Replacement. It is only 25′ 11″ and when put behind a Tractor (Class 8 Truck), it is almost as SHORT, as a Roll off Truck, but since it pivots, it gets into a tighter space and carries almost 50% more weight legally. The New Standard in Roll off Trucks. People use Roll off Trucks, due to they are short and maneuverable. Trailers are 40′ long!! Not anymore. Super Mini Roll off trailer is only 25′ 11″. Two Box -A roll off trailer built for two boxes! Carry two containers at once with ease. Scrap Trailer, Open Top Gondola Scrap Trailer Manufacturer-Robust yet Light! When it comes to a Gondola Scrap Trailer, BENLEE is the place to go. 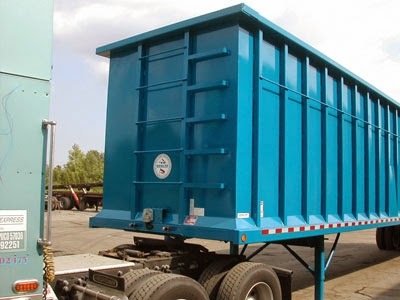 Most know us for the Roll off Trailer, but we are also a full line manufacturer of the Open Top Gondola Scrap Trailer. We make them in really any size you want, from about 45′ to 53′, but we stock, ready to go today 48′ x 102″ wide x 96″ high. A great product to bring light iron or ‘shreddable’ material to a shredder. We build them robust though, so you can even use these enormous trailers to do a tough and Demo project and load them with P&S! We have all world class components such as Meritor Axles and Parker fittings. We have nothing but the best of the best in quality and we even have great pricing. We have a highly experienced team and great business processes, so we move quick and sell direct to you, so there is not dealer mark up!! Also, due to our best in class manufacturing, we have almost zero Warrantee claims, so there is no need to have a local distributor. For any parts you need, no need to even contact a local distributor. You can order every part by calling us at 734-722-8100, or order 24/7 on line at www.benlee.com. So, if you are looking for a Scrap Trailer, call us! Roll off Parts are for Sale, 24/7 at BENLEE on our online store that you can get to at Roll off Parts Store. Of course you can call us during working hours to talk to our friendly people. To support you with roll off truck, roll off trailer and Dump parts, we man the phones at 6:00AM, Monday-Saturday EST. We have Galbreath roll off parts, Galfab Roll off Parts and Dragon Roll off Parts. We even have Gresen V20 and Gresen V40 parts, Valves, Roll Rite Tarp motors, Tarp Systems and more! We have the Roll off trailer parts you need in stock. 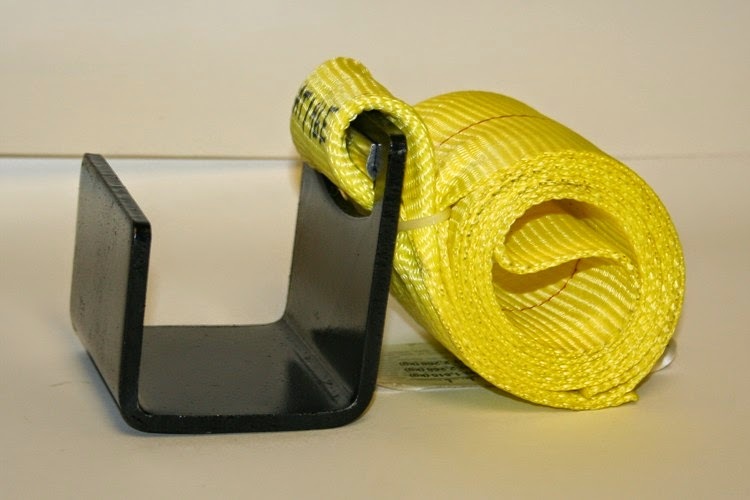 When you need any type of Roll off Hoist parts, just call us at 734-722-8100, or sign on to our website. You can order, roll off rollers, roll off straps, ratchets, valves, tarps, cables and more.